As the US Department of Justice seizes a luxury yacht, $200 million in jewellery and even an Oscar award, Australian PM Turnbull pretends Razak Najib is not a kleptomaniac because Turnbull wants Najib to take Australian refugees. 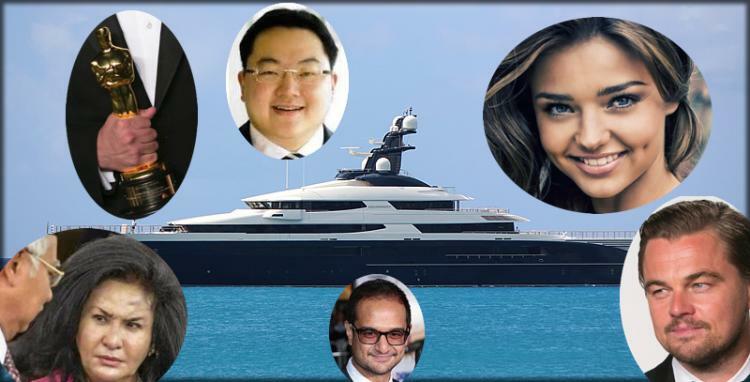 "The US Department of Justice's latest asset seizure notice presents a devastating picture of how Malaysia's record kleptocrats wallowed in their stolen riches, pampering themselves and their jet-set friends with luxuries and jewels. Also, the 251 page document provides detailed and shocking new insights into the conduct of the world's largest and most complex kleptocracy case. HOW LONG CAN NAJIB PRETEND THERE WAS NO WRONGDOING?!" Sarawak Report has done a brilliant job of documenting the systematic looting of Malaysian public assets so we refer you to that publication. Australian model Miranda Kerr and Titanic actor Leonardo DiCaprio have had assets seized by the DoJ. This third court deposition covers one major new area of investigation by the FBI’s financial investigation team, which is described as a ‘4th Phase’ to the 1MDB financial scam, in addition to the already detailed ‘Good Star Phase’, ‘Power Purchase/Aabar Phase’ and ‘Tanore Phase’. They have labelled it “The Options Buy-Back Phase”, a final period of illegal activity that was mainly concerned with attempts to recycle borrowed funds time and again through 1MDB accounts in an attempt to cover up the previous thefts of billions from the fund. Jho Low and his collaborators in 1MDB management had repeatedly siphoned money out of 1MDB’s various bond issues by pretending to be obliged to make payments to settle various ‘guarantees’ and ‘options agreements’ with their business partners at the Abu Dhabi sovereign fund Aabar/IPIC, whose Chair and CEO have been established as leading co-conspirators. To some parties these payments were described as ‘refundable deposits’ (eg to auditors, who were required to treat the payments as assets on the books), whereas to others (e.g. banks) they were described as non-refundable one-off payments to be used by the recipients as they wished. The money was sent to bogus off-shore companies posing as subsidiaries of Aabar and then forwarded on to various bank accounts controlled by Low, usually in the name of further bogus off-shore companies with names that appeared to link them to other major concerns, such as the Blackstone and Blackrock funds. The DOJ also establishes what critics have long pointed to and suspected, which is that another off-shore fund linked to 1MDB, the so-called Bridge Global Fund based in the Caymen Islands, was also entirely bogus. Bridge Global was alleged to have absorbed the investment of supposed capital and profits retreived from the initial 1MDB joint venture with PetroSaudi, boasted to total $2.3 billion. In fact, as SR and others have pointed out all the money was stolen well before the setting up of Bridge Global in 2012. The DOJ confirms that theft and the suspicions that the supposed investment in Bridge Global was in fact virtually worthless. Their investigators detail a series of “fraudulent” manoeuvres designed to disguise the fact that the worth of the fund had been exponentially inflated, assisted by valuations carried out in return for bribes by employees of the Singapore firm NRA Capital. The 1MDB ‘investment’ into Bridge Global was supposedly the claimed $2.3 billion proceeds allegedly gained from selling its joint venture interest in PetroSaudi, which amounted to that company’s single investment in two drill ships now operating in Venezuela under the subsidiary PSOIL. Contrary to earlier claims made to 1MDB’s Board, PetroSaudi had no other major assets. However, PSOIL’s drill ships were valued at less than $100 million, say the DOJ investigators and the company in 2012 had itself registered losses of over $110 million – 40% of that amounted to nothing near $2.3 billion. Therefore, it is of little surprise that the managers of Bridge Global (who were collaborators linked to BSI bank and Jho Low’s relationship managers Yak Yew Chee and Yeo Jiawei) re-invested their non-existent profits in none other than ‘units’ in PSOIL. This was a heavily guarded secret, explains the court filing, which explains that the 1MDB Brazen Sky company, which was supposed to hold the units, was advertised as containing cash and then convertible units. In fact, by 2014 the units in Brazen Sky represented only the value of the two drill ships owned by PetroSaudi, says the DOJ filing, one of which was already so clapped out that it had been decommissioned and the other was at the centre of a major dispute with the Venezuelan Government and had been standing idle for several months. So, when demands were made for that investment to be redeemed from Bridge Global, prior to a planned floatation of 1MDB, which Najib and Jho Low hoped would cover all the losses, Jho Low and his co-conspirators embarked on an elaborate ploy to borrow money from Deutsche Bank and circle it through the Brazen Sky account to make it look as if the money had indeed been recovered and then used up. 1MDB borrowed the money from Deutsche Bank in two tranches in 2014 of $250 million in May and $975 million in September (total $1.2 billion). The DOJ details how Low immediately used $142,000 of the May loan to finish off the remaining payments due on his yacht, covertly diverting the money through a secretive series of misleadingly named off-shore companies named Affinity Equity and Alfa Synergy. The rest of the money was recycled through Brazen Sky to make it look as though this was money being redeemed from Bridge Global fund in the Caymans. Jho Low and 1MDB’s scheme entailed telling Deutsche Bank that the borrowing was to pay Aabar/IPIC for options and guarantees totalling $1.2 billion, which were non-refundable. In fact, that money was diverted into yet another fake Aabar subsidiary in the Seychelles, which he and his collaborators also controlled. From there the money was sent to a specially constructed ‘fiduciary fund’ called Lambasa Global Opportunity Fund, based in Barbados and supposedly the vehicle invested in by the Bridge Global fund managers. In fact it was just one of many such ‘fiduciary funds’, which Jho Low used to transfer money and disguise its origin. From Lambasa Global Opportunity the money went to Bridge Global itself and then to 1MDB’s Brazen Sky, posing as money ‘redeemed’ from the Cayman Island fund investment. This ‘redeemed’ money (which had actually been borrowed from Deutsche Bank for an entirely separate stated purpose) was then forwarded internally to the 1MDB Global account, whose management then claimed to the company’s auditors they used it to pay off the very same options that the Deutsche Bank loan was supposed to pay off. They did that ‘paying off’ by sending the money back to the same bogus Aabar Seychelles account, which did not of course actually belong to Aabar/IPIC. According to the DOJ 1MDB managers then performed the same ’round-tripping’ exercise with exactly the same money six times in late 2014, producing figures that told 1MDB’s accountants that $1.5 billion had been redeemed but then spent on repayments, whilst at the same time 1MDB confirmed to Deutsche Bank that the $1.2 bn loan had also been spent on settling the Options and guarantees. The carefully constructed deception therefore meant telling one thing to the bank and another to the accountant, says the DOJ, such was the deliberate and fraudulent conniving of officials from 1MDB. It got worse. The same 1MDB officials, orchestrated by Jho Low, even forged company bank statements to maintain their deception. The executive responsible is described as 1MDB Official 4, a new player introduced by the DOJ and who is apparently the 1MDB Executive Director of Finance, Terence Geh. The forgery was prompted by a complaint from Deutsche Bank, who pointed out their loan agreement was that there would be no spending from the Brazen Sky account without the bank’s permission, as its supposed value was being used as collateral for the loan. The bank had discovered from the 1MDB official audit that money had been allegedly redeemed from the Caymans into Brazen Sky (as described above) and then ‘used up to cover payments’. Deutsche Bank therefore demanded reassurance of the value of the Brazen Sky account, which 1MDB staff claimed still held the ‘balance’ of the $2.3 billion allegedly now redeemed from the Caymans – amounting to some $900 million plus in cash. Towards the end of 2014 the bank said it wanted to see the figures. At first, the DOJ relates, 1MDB officials stalled and said that their computer servers had crashed and they had lost all their financial records! At the time Sarawak Report reported its own tip-off that 1MDB were indeed claiming their computers had been hacked and recalled all company computers so they could be wiped. Then 1MDB Officer 4 produced BSI bank statements for Deutsche Bank to review. There was a November statement and then a later one. It is this document that 1MDB Offcier 4 fraudulently altered in an act of forgery, according to the DOJ, in order to deceive the bank that there was indeed around a billion in cash in the Brazen Sky account. In March 2015 it was Sarawak Report that again broke the news that Singapore regulators had confirmed to Bank Negara officials that a forged bank statement had been presented – and it was this damning discovery which had effectively triggered the entire global investigation into what has become the world’s biggest kleptocracy case. Ironically, it is BN politicians and 1MDB officials who have, time and again, accused Sarawak Report of forgery and tampering, when it is in fact they themeselves who have thus been caught red-handed in the act. 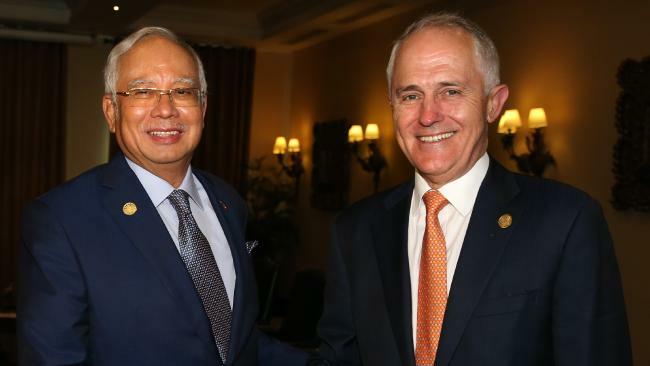 Meanwhile Australia's own Cayman Islands operative, Malcolm Turnbull is still trying to dump Australian refugees in Malaysia. It must be a 'convict thing' that people like Turnbull have hard-wired into their brains?